add 1 tbsp of oil and swirl around the wok. Once the oil starts to smoke, wait a few seconds then crack in the eggs. At this point you can move the eggs around but don't break the yolks until the white starts to cook – once this happens, crack the yolks and mix together. Next, push the eggs to the back of the wok then add the rest of the oil. Wait again until smoking then throw in your rice, and squash down to separate the grains with the back of your ladle. Mix together with the egg until evenly distributed then tip in the peas. 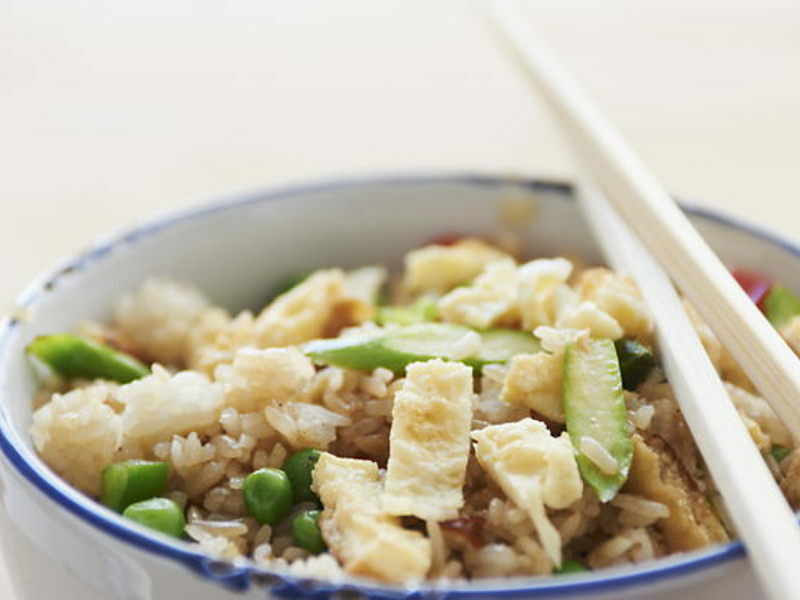 Sprinkle with a light covering of light soy then mix together and continue to stir fry. Add a few drops of sesame oil then stir together with the spring onion.